At some point during your time of working with chickens, you might encounter eggs that look like they have insect eggs on them. The view can be disquieting at first—all sorts of images could go through your mind. However, it’s more likely that what you’re actually seeing are calcium nodules that merely look like insect eggs. Here is an egg that has such nodules on it. Calcium nodules can look like insect eggs. The hen is getting older and her egg production organs are no longer working as efficiently as they once did. The hens are getting too much calcium in their diet. The first reason is the one that occurs most often. Five of my hens are now four years old and one is five years old. The five year old hen (a Black Australorp) laid this egg, so the nodules aren’t unusual at all. (Most factory settings keep laying hens for one or two years after they start laying eggs, I’ve found that four years in optimal settings works well.) This spring I’ll replace two of the hens with new layers (the other four are pets and will die of old age). I also had one hen eaten by hawks and another died of an impacted egg, so I’ll actually get four new layers this spring. I’m thinking of trying Barred Rocks (a kind of Plymouth Rock) because I’ve never had them before and they’re quite pretty. According Henderson’s Chicken Chart, they’re cold hard and produce large eggs. A friend of mine has them in her flock and feels that they’re a good investment. 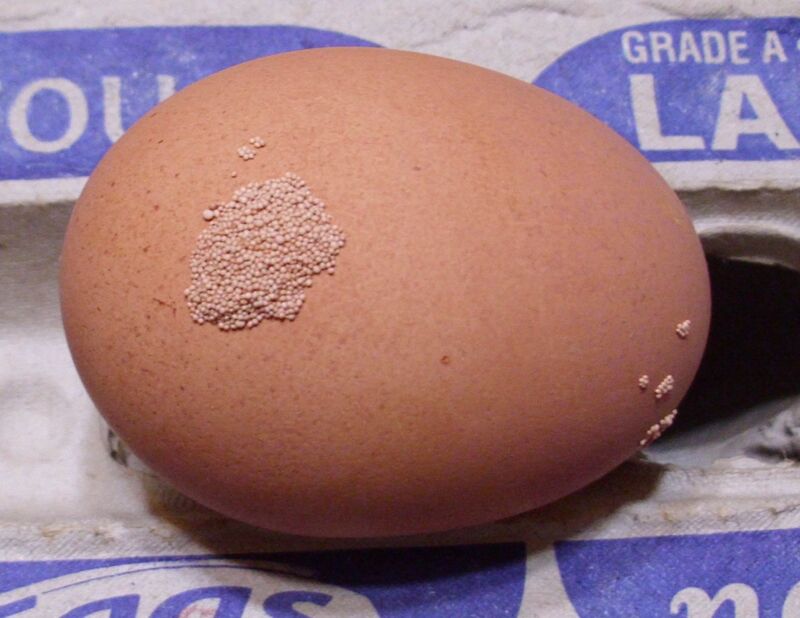 The point is that when you start seeing these nodules on one or two eggs and not on the eggs of your flock as a whole, you may need to start thinking about replacing the bird that laid it. Let me know your thoughts about keeping a healthy flock at John@JohnMuellerBooks.com.